It can get hot in Maui. 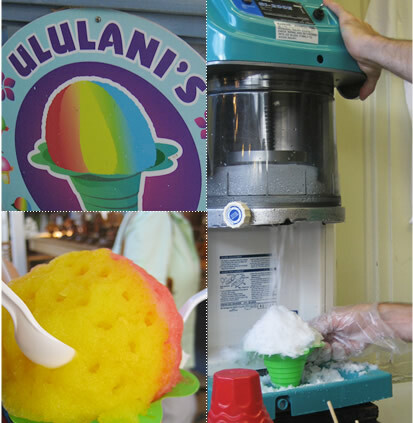 But if you’re looking for a refreshing way to cool down, skip the ice cream or slurpee and head on over to Ululani’s Hawaiian Shave ice on Front Street in Lahaina. 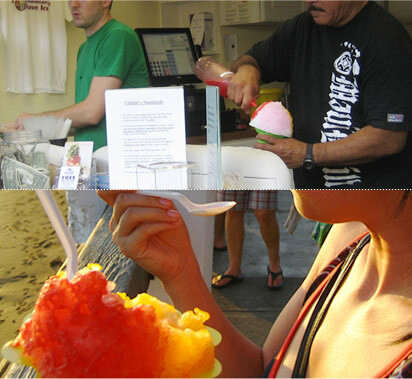 Ululani’s started in Vancouver, Washington (of all places) by Oahu natives who missed the taste of Hawaiian shave ice during the summer months. They eventually moved back to the island and lucky for us, brought their shave ice back with them. Expect the service to be slow, and the line ups long. They take their time at Ululani’s — carefully carving off the ice shavings with craftsman-like precision. At one point, the guy shaving our ice was unsatisfied with the ways the ice shavings were coming out, so he unmounted it and got a whole new block of ice. Once he was satisfied with the texture and consistency, he whipped the plastic, flower shaped container overflowing with ice and skillfully poured over a rainbow of flavours — the bright colours bleeding as it touched the ice. Case and I shared a “small” Sunset Beach (Guava, Mango, Passion Orange) as we strolled along the boardwalk — the sun setting slowly over the beach, mimicking the flavour of our shave ice. The shave ice was heavenly soft, like virgin fresh powder. The fruit syrup danced on our tongues — yeah, there was probably a boatload of sugar in it — but we didn’t care. This was perfect. At $4 for the small (which is ridiculously large, and enough for two), this is one of the most enjoyable ways to cool down. Perfect for: Cooling down Hawaiian style.